How good are you at dealing with change at work? Dealing with change at work is something we all have to face but we’re not all as accomplished at this as we like to boast on our CVs. Try my simple challenge to see how well you adapt to change, then consider how this can applied to your working life. It has become somewhat of an interview and CV cliché to say we are great at leading, managing and dealing with change at work. Given that the only certainty in business seems to be change, it supports our careers and our businesses to have this seemingly essential skill set. My experiences of working with teams before, during and immediately after major changes (both positive and negative) suggest, however, that we all process change differently, and that many of us are not as good at dealing with change at work as we like to think. If you think you find change easy, try wearing your watch on the other wrist for a week, or putting your coffee cup the other side of your desk. These are small and insignificant changes, I am sure you will agree. But, assuming you don’t do what most people do and resist this change, it will feel very strange at first. When want to know the time, you will look at the wrong wrist. Then, when you reach for your coffee, it won’t be where you expect – and be careful not to spill it (don’t ask how I know to issue that warning!). But gradually, as the week progresses, you will get used to the changes and they will simply become the way things are. As you try this little experiment, I encourage you to notice how it feels and to be very honest with yourself. What were your emotional reactions? Did you find yourself forgetting about the change or getting confused about what you should do? How did you become used to the new reality? If I were to ask a group of you to share your experiences of this experiment, there would be a huge range of reactions, all experienced at a different pace. The same is true as we apply this to our business worlds, which gives leaders an interesting set of challenges. As leaders of change, project managers and people who are dealing with change at work, being really honest with yourself about how you are coping with the changes you are facing, and noticing how you feel, will provide valuable insights to help not just yourself but the people around you move through the changes productively. I challenge you to try making one small insignificant change to your daily routine and notice how it goes, then make a note of what you learned about yourself and how you cope with change. These lessons can then be applied to dealing with change at work. If you are managing projects or leading a change I would also encourage you to share this challenge with your team; the discussions that follow will give you some very valuable insights that you can then use as leaders and in designing the programme. This is just one exercise Bekka uses when working with leaders and teams to set up their projects and change programmes for success. 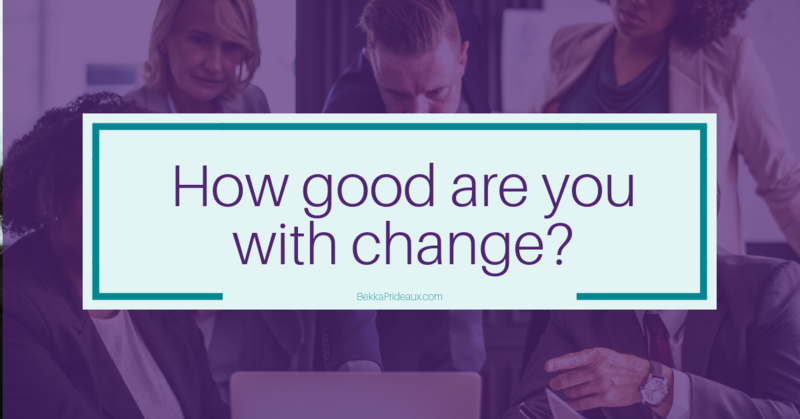 If you are looking to implement lasting changes at work, or have an important project you are kicking off, book a free consultation call to discuss how Bekka’s change and project expertise can help you.